The coolant consists of water with a concentration of coolant additive. This mixture guarantees antifreeze protection, protects the cooling/heater system against corrosion and prevents the formation of scale. Vehicles exported to countries with a mild climate are already factory-filled with a coolant which offers antifreeze protection down to about -25 °C. In these countries the concentration of coolant additive should be at least 40 %. Vehicles exported to countries with a cold climate are already factory-filled with a coolant which offers antifreeze protection down to about -35 °C. In these countries the concentration of coolant additive should be at least 50 %. If a higher concentration of antifreeze is required for climatic reasons, the amount of coolant additive can only be increased up to a maximum of 60 % (antifreeze protection down to approx. -40 °C). 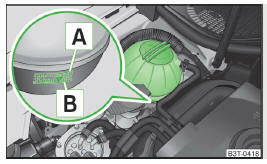 When refilling, only use the same antifreeze identified on the coolant expansion vessel » Fig. 129 on page 145.
your journey if for some reason it is not possible to top up the coolant under the current conditions. Switch off the engine and seek assistance from a specialist garage. The amount of coolant additive in the coolant must never be allowed to fall below 40 %. Over 60 % coolant additive in the coolant reduces the antifreeze protection and coolant effectiveness. A coolant additive that does not comply with the correct specifications can significantly reduce the corrosion protection. Any faults resulting from corrosion may cause a loss of coolant and can consequently result in major engine damage! Do not fill the coolant above the mark A » Fig. 129 on page 145. We recommend that you visit a specialist garage if a fault causes the engine to overheat, otherwise serious engine damage may occur. The coolant expansion bottle is located in the engine compartment » Fig. 129. Mark for the maximum coolant level. Mark for the lowest permissible level of coolant. The coolant level should be kept between the marks A and B. If the coolant level is above the mark A, no coolant may be topped up. If the coolant level is below the mark B, the coolant must be topped up. 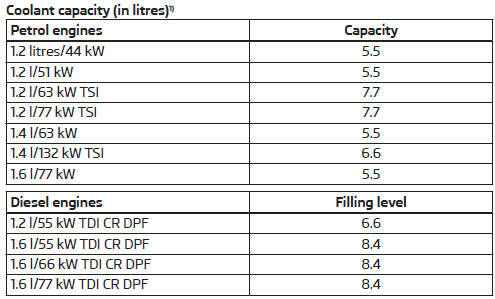 Check the level of coolant at the coolant expansion vessel » Fig. 129. Check the coolant level only when the engine is cold. If the engine is warm, the test result may be inaccurate. The stand can also be above the mark A » Fig. 129 . We still recommend inspecting the coolant level directly at the reservoir from time to time. A loss of coolant is first and foremost an indication of a leak in the system. Do not merely top up the coolant. Have the cooling system checked by a specialist garage. Only top up with new coolant. Allow the engine to cool. Place a cloth over the cap of the coolant expansion tank and carefully unscrew the cap. Turn the cap until it clicks into place. Do not use an alternative additive if the specified coolant is not available in an emergency. In this case, use just water and have the correct mixing ratio of water and coolant additive restored by a specialist garage as soon as possible.